Have you ever watched those documentaries exploring the world just beneath the water surface and wished you were there? Snorkeling is a great way to go one step further and explore the wonders of the ocean on your own. Submerging in shallow waters requires no professional training. This activity is safe enough for people of all ages and all walks of life. All you need is adequate snorkeling gear and a bit of know-how. In this ultimate guide to snorkeling, we’re going to tell you all you need to know to leave the adventure of your dreams. Snorkeling may be a fun adventure for most people, but if this is your first time, there are a few things you should consider before getting started. We’re confident that the last thing you want is to transform a fun adventure into legal trouble. There are many protected areas in the oceans and seas around the globe where snorkeling is illegal. If you don’t want to pay hefty fines or get yourself arrested, make sure you know the laws and pick a location where snorkeling is allowed. Among all diving activities, snorkeling is the safest. This doesn’t mean it comes without risks. Luckily, since you’ll be swimming in shallow waters, the chances of drowning are remote, but you should still use a safety vest though. A much higher risk comes from the sun. The combination of water and UV rays may result in severe burns. It is essential to use a biodegradable sunscreen, but pay attention to the biodegradable specification. All other sunscreens are harmful to the environment, and they are even banned in many snorkeling places. Underwater fauna may also pose some risks; while it’s unlikely to see a shark, jellyfish stings can also hurt you. This rule is valid regardless of your swimming or snorkeling experience. Adventuring alone is never safe. A snorkeling buddy or guide can help you if anything should go awry. Don’t just assume that because the area is deemed as safe nothing can happen. Underwater, everything can put your life at risk, even something as little as a muscle cramp. Does practicing in a pool sound stupid or amusing? Wait and see how tricky it is to breathe underwater through the snorkel. Or how awkward it feels to swim with the fins. You don’t have to trust us, just put on your gear and plunge into a pool. Once you realize it’s not all so easy as you thought it would be, just practice a little so that you can avoid looking like a rookie when you finally reach your snorkeling destination. Even if this is the adventure of your life, it doesn’t mean you can just get to the snorkeling place and expect it to happen. You need a bunch of stuff to go underwater, so make sure you have all the snorkeling gear at hand. Also, learn as much as you can about your destination. Learn what fish you can expect to see or what unique marine vegetation populates the area. All this will make your first snorkeling experience much more relaxed and enjoyable. Snorkeling goggles– also known as snorkel masks, are special goggles explicitly designed to keep water out of your eyes and nose. They must fit perfectly around your face, and a rubber or silicone band attaches to your skin, preventing water from reaching your eyes. 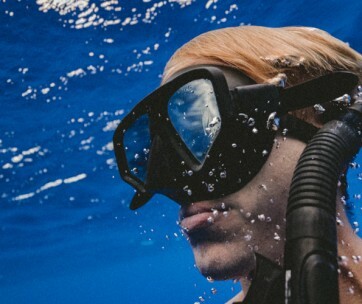 At the same time, a nose piece prevents that salty ocean water from getting into your nose and throat if you can’t refrain the impulse of breathing. While you could snorkel without goggles, they truly enhance the experience, allowing you to keep your eyes wide open and enjoy the underwater world. Buying the snorkeling goggles could be your best bet, as you’ll be able to find a pair that fits you perfectly. However, you can also rent them in most places if you only plan to go snorkeling occasionally. Snorkeling fins – just like the snorkeling masks, snorkeling fins are one piece of equipment you can do without. But having them makes a huge difference. Their role is to help with propulsion, and they come in handy when you have to swim for long distances. Since there is no way to take an energy bar with you on this adventure, we genuinely recommend wearing fins. 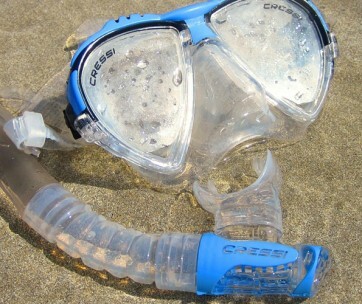 Snorkels– by far the most essential piece of equipment, and the one without which you won’t do any snorkeling is the snorkel. This is a tube you use for breathing underwater and consists of a mouthpiece and an open end that goes above the water level. Snorkels are also easy to find and rent in most places, but since this thing will go into your mouth, it may be wiser to buy your own. After all, these tubes are not expensive, and you’ll have peace of mind. Wet suit – is only essential if you plan to snorkel for the whole day. Their role is to protect you from sunburns, as well as wind burns if there is a strong wind. Biodegradable sunscreen – keeping your skin protected from harmful UV rays is essential whether you’re snorkeling or not. But if you want to adventure into the ocean without harming the delicate ecosystem, then biodegradable is a must. This type of sunscreen, also called mineral sunscreen, doesn’t contain harmful chemicals but only zinc oxide or titanium dioxide particles that provide a physical barrier between your skin and the rays. Studies have shown that this type of sunscreen is environmentally friendly and doesn’t cause coral bleaching. Now that you know the snorkeling essentials and what gear you need, you might also want to find out which are the best places in the world to snorkel. The truth is that it’s hard to nominate the best. Each stretch of ocean, lake, or sea has its own wonders, and they are all well-worth discovering. Nevertheless, here are the top-rated – and our favorite – snorkeling places you should explore. The Great Barrier Reef is hands-down the best place in the world to snorkel. It’s considered to be one of the seven natural wonders of the world and comprises thousands of individual reefs you can explore. This place is home to over 1,500 species of fish, six species of sea turtles, and hundreds of other forms of life. Micronesia is one of the most popular destinations for divers and snorkelers, but Jellyfish Lake is often underrated, although it offers an amazing experience. Its name says it all. You won’t be swimming in open waters but in a saltwater lake home to thousands of luckily harmless jellyfish. Watching the sunbeams passing through these delicate creatures is a unique, mesmerizing experience that you’ll unlikely forget. If you would rather steer clear for the jellyfish, even if harmless, the Rainbow Reef in Fiji might hook you. Thousands of colorful fish species and other marine life forms populate the rainbow corals in this area. The Komodo National Park is not famous for snorkeling, but for the giant lizards known as Komodo dragons. Because the island of Komodo and its surrounding area is protected, the underwater bursts amazing marine life too. So, if your biggest dreams are to see real dragons and take a trip down under, Komodo is the place to go. A far away, a cold country such as Iceland is not the first place that comes to mind when thinking about snorkeling. Nevertheless, a dive here is as rewarding as a swim into any of the exotic locations. Silfra will welcome you with the most transparent water you’ll ever snorkel into, and you’ll get a chance to explore marine life between two continents, the North American and Eurasian one. This is a place like no other that will reveal unique forms of marine life you never knew existed. If you don’t want to get as cold as ice and would much rather prefer a tropical destination, head to the Bahamas. The Dean’s Blue Hole is another of those fantastic places worth exploring. The hole itself appeals to divers, but this doesn’t mean snorkeling here is off limits. Explore the surrounding reefs and admire the sand disappearing into the astonishing blue nothing beneath. From all snorkeling destinations, there is nothing that can beat the Maldives. The islands are not only an attraction for the rich; they are home to over 700 species of the most stunning fish in the world. The shallow aquamarine deeps also hold a myriad of other marine wonders, like corals, anemones, small sharks and turtles, and maybe you’ll even spot an octopus or two. Snorkeling can be the most amazing experience of your life, or the most daunting one if it catches you unprepared. That’s why we have some tips you should know before plunging in the ocean. The greatest thing about snorkeling is that you don’t have to be a professional swimmer to do it, and anyone who masters the basic techniques can snorkel without worries. Improving your swimming can enhance your whole experience though by boosting your stamina, endurance, and confidence. Don’t believe that just because you have a snorkel, you don’t have to hold your breath. Waves, the position of your head, and even the desire to get a bit closer to the reef can cause water to go into the tube. If you want to avoid panic, learn how to hold your breath for longer. Although exciting, the first snorkel can also be frightening. The only thing is that panicking into the water can be dangerous both for you and anyone else who’s with you. That’s why it is essential to practice in a pool or in an area you are familiar with before diving into the unknown. To stay even more relaxed, find out what species you are likely to encounter so that they don’t catch you by surprise. The main rule of snorkeling is that you must never touch anything. It doesn’t matter how cute that school of fish looks or how colorful is the coral. Take a waterproof camera with you, snap some selfies with the underwater life, and move on without getting your hand on anything other than your camera, the water, and the sand. Not only you can harm the marine creatures, but some may also sting or bite you. Saving some money to pay for your trip is always nice, but you shouldn’t compromise on your snorkeling gear. 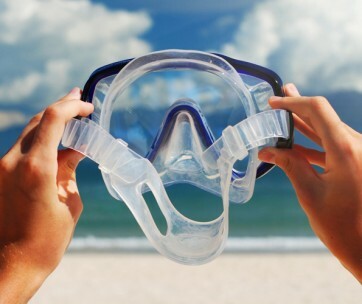 Find masks, snorkels, and fins that are reliable and fit perfectly. Otherwise, you might have to deal with improper gear aftermaths. And now that you know what to expect and where are the best places to snorkel, book that trip, pack your equipment, and go explore the wonders of the ocean.